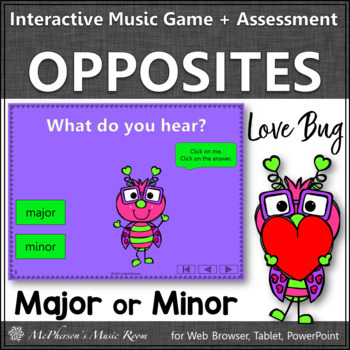 Looking for a Valentine's Day Music Game for your elementary music lesson that will reinforce aurally identifying major or minor? 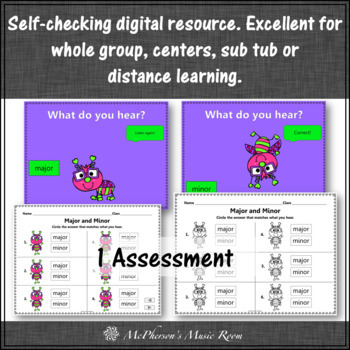 This digital resource is an excellent addition to your February music lesson plans or anytime you are working on the concept. 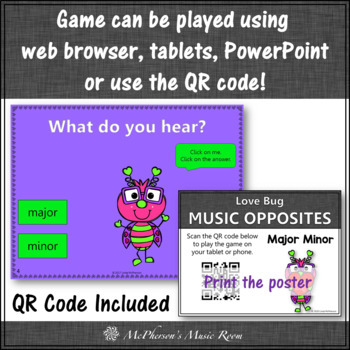 An engaging music game for the entire class, music sub tub or music centers! Perfect addition to your Orff lessons and Kodaly lessons. 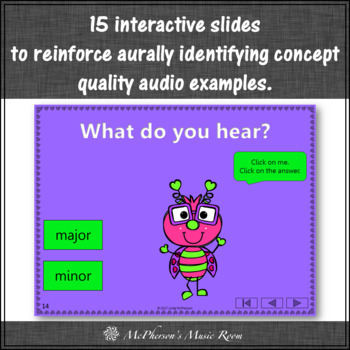 The product contains 15 student interactive slides (created with PowerPoint 2013). Each slide has several sound effects and animations. Students will click on the bug to hear a sound. They will then click on the word that represents what they hear! Students will know immediately without leaving the page if they are correct. Be prepared for a brain break of laughter and movement when they select the correct answer. It is a perfect addition to your Orff and Kodaly resources. The product works well with Smartboards! Students just have to touch the board to activate the animations. ★ A student test (to be printed in black/white with one per page). ★ A sample slide of the student test (created with PowerPoint 2013). Instead of playing the sounds on an instrument just project the slide on your board and access the sounds by clicking on the bug! Interested in additional “Love Bug” products? Click HERE.